Home › Electronics › Thermaltake Versa N21 Snow Edition Translucent Panel Atx Mid Tower Window Gam..
Thermaltake Versa N21 Snow Edition Translucent Panel Atx Mid Tower Window Gam..
TOOL-FREE DEISGN: The innovative 5.25" & 3.5" tool-free drive bay design minimized the hassles of installation/removal. The trio drive bay concept of "1 + 4 + 1" offers a good ratio for accessories and storage devices. MORE: Pre-mounted holes support motherboards up to standard ATX. CPU cooler installations with up to 160mm radiator at the top and 250mm long graphic cards are supported. 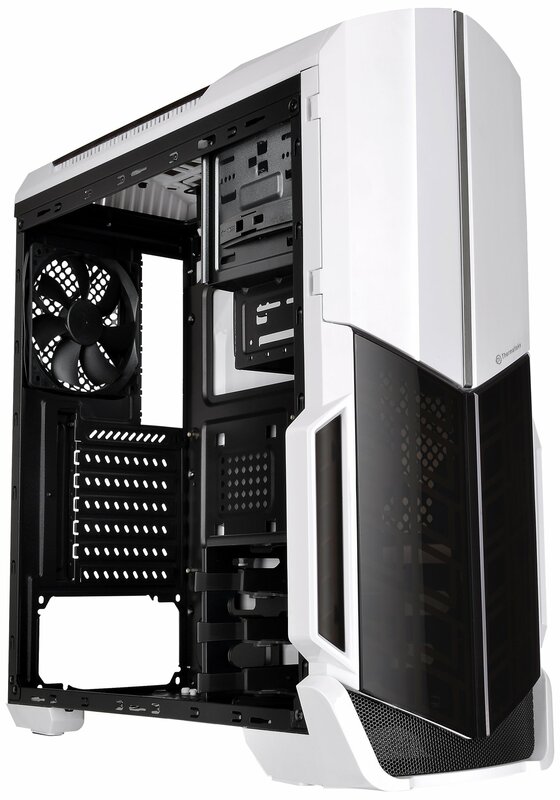 Color: White Versa N21 Snow Edition SPCC Mid Tower Gaming Computer Case - White Product Features: Gaming-Oriented Concept: Built for gamers by gamers, the glossy white finish with translucent Top/Front panels and triangular shaped side window. Supports both USB 3.0 and 2.0 ports with HD Audio ports for convenient top/front panel access Storage Supported: Tool-free 5.25" / 3.5" ODD/HDD for easy installation, SSD mounting supported with "Hidden" SSD mount behind MB Tray Easy I/O Location: Top-front panel features grant easy access for USB devices and audio. Optimized Ventilation: Preinstalled 120mm rear fan with optional fan locations on Top and Front panels. Warranty: 3 Years: Experience a balance of budget and building with the Thermaltake Versa N21 MidTower Chassis. Perfect for the first build or the next, this affordablechassis provides exceptional cooling performance, tool-free installation andoptions for air and liquid cooling configurations. Designed with translucentfront and top tinted panels, keep up airflow with custom side ventilation fromtop to bottom with the Versa N21. Key Features: Case Type: ATX Mid Tower Chassis Case Dimension (H x W x D): 20.2" x 8.5" x 18.2" M/B Type: ATX (12.0" x 9.6"), MicroATX (9.6" x 9.6"), Mini-ITX (6.7" x 6.7") Side Panels: Window Supports Standard PS2 Power Supply External Bay: 1x 5.25", 1x 3.5 (Floppy) Internal Bay: 3x 3.5" or 2.5" (HDD Cage), 1x 2.5" (M/B Tray) - Hidden Expansion Slots: 7 Front I/O Panel: 1x USB 3.0, 2x USB 2.0 1x Headphone, 1x Mic PortsFans Included: Rear (exhaust) : (1) 120 x 120 x 25 mmClearance: CPU Cooler Height: 160mm VGA Length: 250mmFan Configurations: (Optional) Front: 2 x 120mm Top: 2 x 120mm Rear: 1 x 120mm Radiator Configurations: (Optional) Top: 1 x 120mm or 1 x 240mm Rear: 1 x 120mm Support Please visit our website or search "Thermaltake Support" for any assistance.